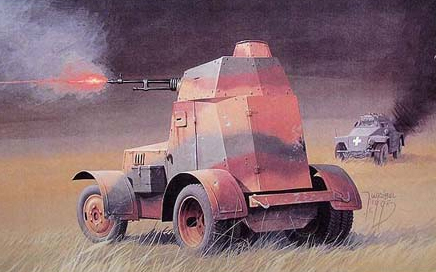 The Samochód Pancerny wzór 28 (“armored car model 28”) was born from a 1926 specification. 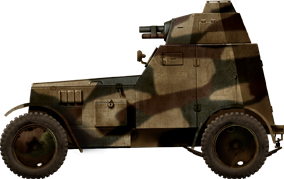 It was based on the Citröen-Kégresse half-track system, of which 135 had been purchased previously. 90 such chassis were converted into armored cars at the CWS workshops. These entered service between 1929-31. 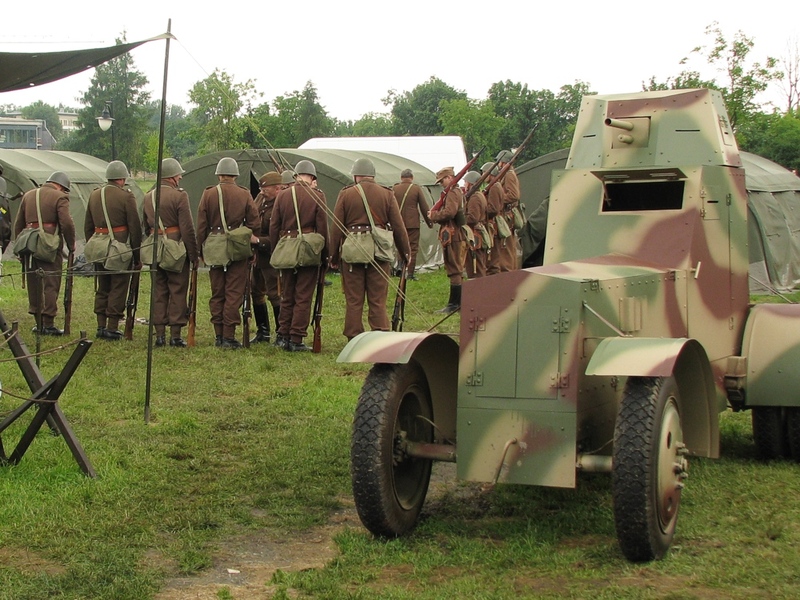 By 1934 they formed the 2nd and 4th Battalions and an independent armored car company in Bydgoszcz. However, there had been many reports about their insufficient speed and off-road qualities, high center of gravity compromising sharp turns and other issues related to the tires. 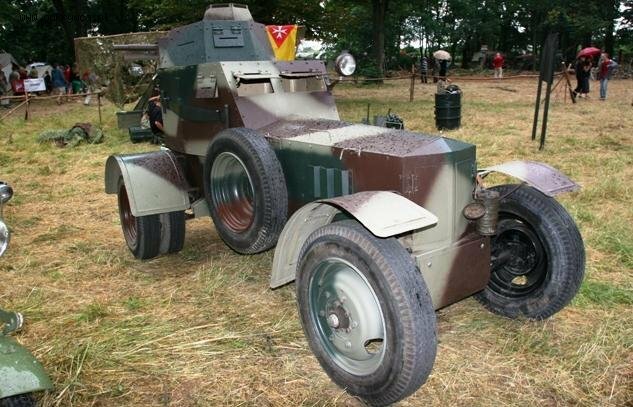 Because of this an order was issued in 1933 for a conversion into fully wheeled versions, becoming the wzór 34 (wz.34) armored cars. The conversion was performed between 1934-35. The conversion was executed by the Armored Weapons’ Technical Research Bureau (BBT BP) using commercial truck components. Although their general appearance seems barely changed, the conversion was not limited to the drive train. The hull was slightly lightened at the top while the lower hull received reinforcements which lowered the center of gravity. The broader track of the rear axle (taken from the Fiat-614 light truck) double tire made it more stable. The prototype was tested between April and July 1934 and, although the off-road capabilities were not improved, the stability and road speed were way better and these characteristics were judged satisfactory enough to order a full conversion. 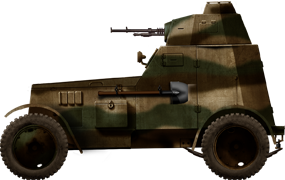 They were accepted in service on the 4th of June, 1935 as the wzór 34 (model 1934). Many conversions were performed in individual workshops, on BBT BP specifications. Final models differed considerably, although two main types were known. 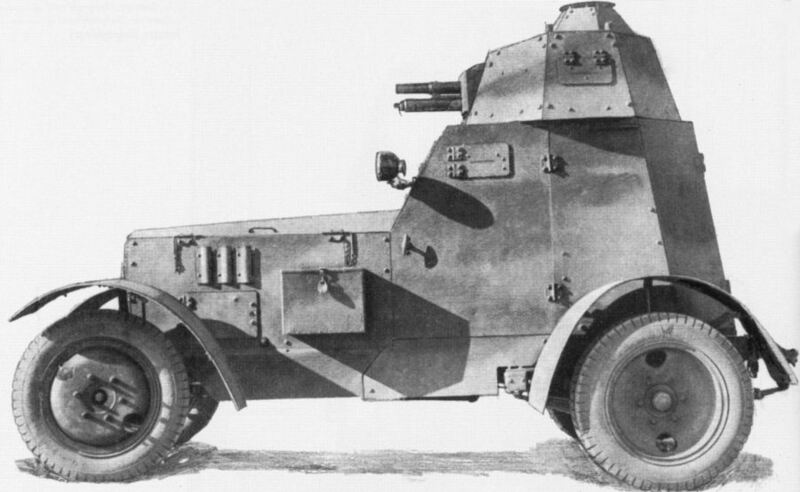 The wz.34-I, based on the early hull type with vertical rear back plates, and the wz.34-II with sloped back plates, a greater wheelbase and the turret shifted to the front. About 1/3 of these vehicles (often platoon leaders) were armed with the standard Puteaux SP-18/21 37 mm (1.46 in) gun with 96 rounds, while the others received a 7.92 mm (0.3 in) Hotchkiss wz.25 machine-gun with 2000 rounds. For the early (I) version, the rear superstructure formed two sponsons above the rear mudguards. The turret was placed at the rear end of the fighting compartment and the driver had two vision hatches. The engine hood differed also, some featuring the front hood fixed and a later model with a fully opening hood. Perhaps 27 of the entire lot were of this version. For the late (II) version the rear superstructure had flat sides, sloped rear. The turret was moved forward. The bottom was now straight. The driver had a single vision hatch, the engine was a more modern Fiat-108-III and the rear axle came from the Polski Fiat-618. Hydraulic brakes and better electric wiring were also fitted. The wz.34-II were the most numerous conversion, perhaps 60 in all. Minor modifications by local workshops and the lack of reliable plans made it very difficult to have a clear picture of the characteristics of these versions. The vehicles were grouped into formations of nine, called “dywizjon” (sub-division), comprising three platoons of three vehicles. They were spread out with the 1st Armored Battalion in Poznań, 4th in Brest-Litovsk, 5th in Cracov, 8th in Bydgoszcz, 12th in Luck, but also extended units in the 6th at Lviv (17 vehicles) and 7th at Grodno (25 vehicles). During mobilization, in 1939, ten armored units (battalions) were constituted and performed various reconnaissance missions just before the attack. During the first week of engagement, most were destroyed in hopeless engagements despite the crew’s individual bravery, due to their lack of armor and poor armament. The low-velocity SA-18 37 mm (1.46 in) was never intended for antitank combat. By 23 September only a handful had survived. Detailed reports show that 55% were combat losses, 35% broke down and 10% were abandoned due to lack of fuel. That means that only 10-20% were captured in relatively serviceable conditions and used by the Germans for local police operations. Some sources suggest that one unit of 18 vehicles was sent to the Croats for anti-partisan warfare in the Balkans. wz.34-I or “early type”, with the early 1935 spotted pattern. wz.34-II or “late type”, gun armed version, in practice often used by the platoon commander. It sports a “checkerboard” blended pattern, made of large roughly horizontal spots. 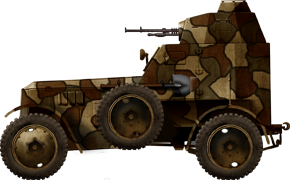 wz.34-II in September 1939 with the late camouflage pattern made of horizontal blended bands. In some cases the bands were even smaller in width, with four stacks of three gradients rather than three as seen here.